Sable lives in the big city, but she dreams of a quiet, solitary life in Wyoming. Getting there, unfortunately, will be murder. 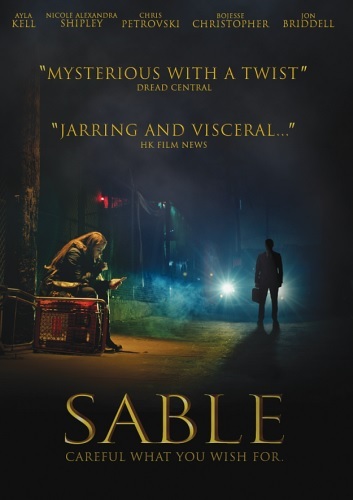 That's the set-up of the 2016 thriller SABLE (Indican Pictures) by writer-director Michael Matteo Rossi (MISOGYNIST, LOSS OF LIFE), who has managed to craft a finely-wrought nailbiter with a surprising introspective streak. When Sable is attacked in an alley, her much-older boyfriend Landon (Jon Briddell, THE MILLENNIUM BUG), a recovering alcoholic with a volatile temper, kills the guy with one vicious blow to the head. Stuck with a dead body in a car trunk, they turn to Landon's shady son Colton (Chris Petrovski, "Spartacus: War of the Damned") for help. Colton's price for one body disposal: Sable must seduce a local moneybags businessman, get as much cash as she can from him without actually "doing it", and split it three ways. If it works, she and Landon are on their way to Wyoming instead of prison, he's in coke money for a few weeks, and all's right with the world. Except there's no freakin' way this potential trainwreck of a plan is going to go smoothly because, as we all know, there's nothing like a beautiful woman trying to get her jealous, mean-drunk boyfriend out of a jam by seducing a handsome, eligible millionaire. And thus, SABLE's deliciously devious plot is set into motion. Naturally, our heroine's attempt to win the amorous attention of rich guy Andres (Rodney Eastman, I SPIT ON YOUR GRAVE, A NIGHTMARE ON ELM STREET 3-4) is an instant success because (1) she's a knockout in a minidress (we're talking serious legs here), and (2) that's what has to happen or else there's no story. We're lulled into thinking Andres is just a big puppy-dog pushover because he seems really sweet and lonely and is nice to his daughter and everything. And just when it looks like Sable may pull this thing off easy as pie, we find out that there's a lot more to Andres than meets the eye. Which is just about when all the suspenseful buildup starts to pay off in scary. SABLE takes its sweet time and lets things get introspective and even a little wistful now and then--it's interesting enough so that our attention doesn't wander during some nice, crackly dialogue or quietly disquieting moments. The thoughtful character touches occasionally lend the story a measure of depth one usually doesn't expect from a straight thriller. But then, inevitably, comes the time for things to finally get dead serious, and that's when Sable's tragically less-than-foolproof plan takes a devastating detour into shocking violence. Michael Matteo Rossi directs his own screenplay with economy and a nice visual flow. 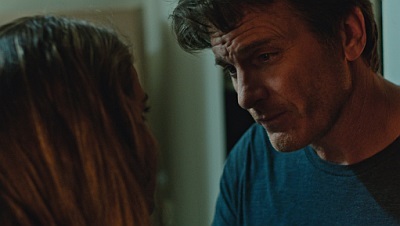 He's fortunate to work with an outstanding cast--led by winsome Ayla Kell (THE OMEGA CODE) as the titular temptress--who really get into their characters. The evocative musical score by Gavin Brivik compliments the action quite effectively. SABLE starts out slow and then gets more twisted and complicated as its various subplots intertwine into one big, lethal mess. The ending is jarring and visceral, and yet, to my surprise, emotionally resonant in a way that sticks with you as the final credits roll. "RAW" -- What Are You Hungry For?